We’ve arrived at the end of the first week of the great kitchen renovation project with sanity (barely) intact. 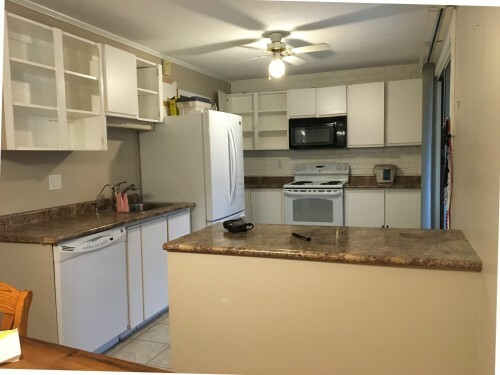 In case you were wondering, it takes about a full week to adapt to the idea of not having a kitchen, and apparently longer to the idea of not having a sink, because I still catch myself moving toward where the sink used to be with the dregs of a can of soda or snack bowl to be rinsed or an apple to be washed. We seem to be making good progress. We have passed through the destruction and discovery part of the remodel, which was definitely the most fraught with peril. 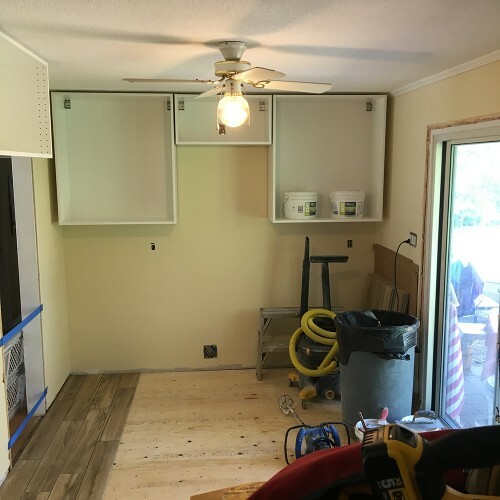 We discovered several code violations in the wiring and a few outright fire hazards that added another chunk of change to the final bill for some electrical work, including no less than five (FIVE!) issues with the oven outlet alone. The previous owner’s habit of playing fast and loose with structural and electrical issues continues to haunt us six years after the fact, but at least the microwave hood fan will no longer vent to the gap between the walls (sigh) and we know that the household wiring is safer than it was before. 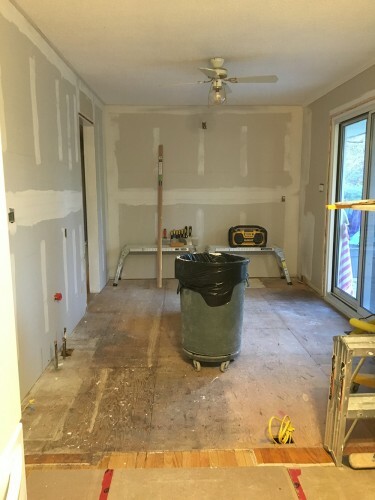 Here’s how we progressed each day of the renovation. Day one was destruction and discovery day. 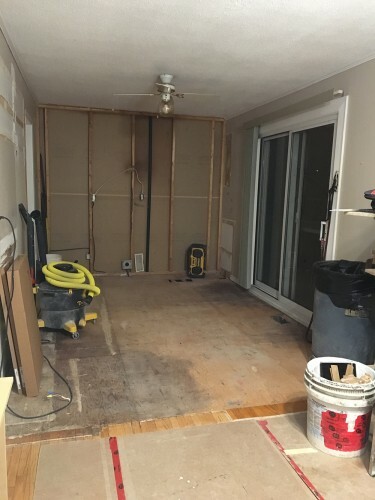 Greasy stained drywall was removed, subfloor pulled up, mystery pipes were revealed, and electrical hazards became apparent. 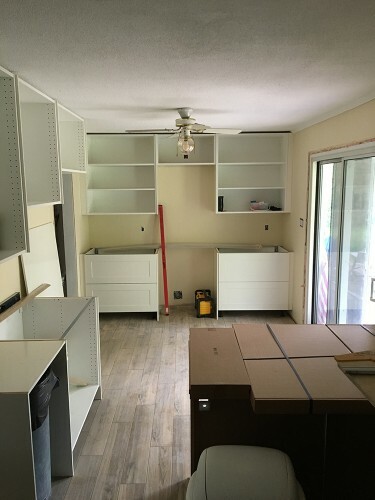 Day two comprised more prep work, and the delivery of the bulk of the new cabinets and cupboards. Our dining room became a storage / staging area. Nerves frazzles and frayed. Day three was dedicated to electrical work. 15 amp wires that ran into 30 amp breakers were updated, dangling outlet boxes were secured, blatant code violations were remediated, and blessed routine was reclaimed from the chaos. Day four brought fresh drywall and approved permits for the electrical, and a sea change from destruction to construction. Yay progress! 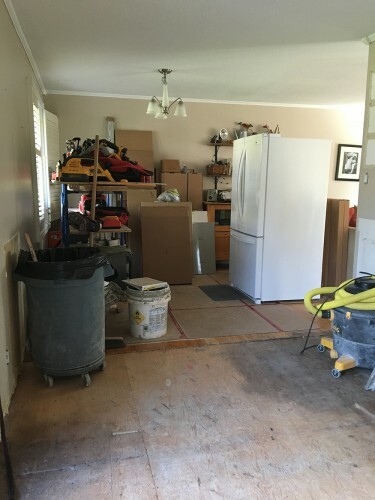 The one thing that the last week has illustrated is that we were insane to even consider taking on the kitchen renovation as a DIY project. There is no way we could have even identified, let alone dealt with, the issues that have come up so far. 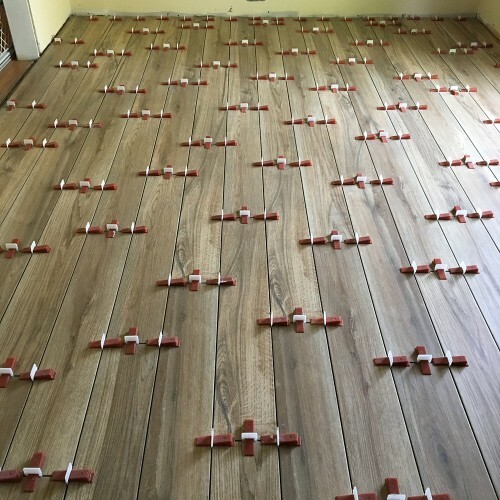 They weren’t devastating, and they were easily addressed by the contractors, but from tearing up the subfloor to the safety issues with the electrical, I have been grateful to have someone who knows what they are doing. 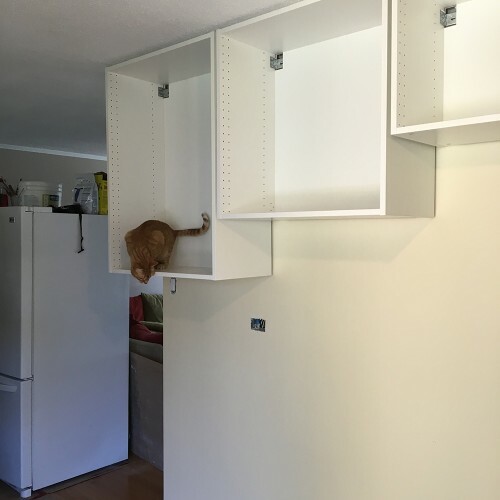 Even if we did manage to install the cupboards and cabinets ourselves, it would have been putting lipstick on a pig because there were so many small but important structural issues that needed to be addressed so we could build upon a strong foundation. I’m full of optimism for next week, which should bring subfloors and tile floors and fresh paint. I’m also relieved that the last of the major decisions has probably been nailed down, and I will no longer be frantically Googling various faucet models, ceiling fans and over-the-range microwave reviews. 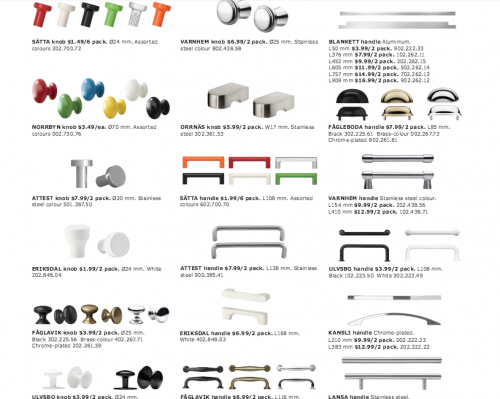 Trying to decide whether the drawer pulls need to harmonize with the sink fixtures may have been the nadir in decision-making “who really cares about this sort of thing?” hell, but we’ve made it through to the other side. We’re managing meals with a mixture of takeout and sandwiches, and I bought more pre-packaged and processed foods in the grocery store today than I’ve probably bought in the last year. I honestly can’t remember the last time I bought packaged cookies, but hey, there were PC Points for Oreos today so I stocked up. An hour later, they’re already mostly gone, of course. TL;DR? Week one was long and stressful, but could have been far worse. Having a team we trust doing the work has made all the difference in the world. And doing the dishes in the bathroom sink is far from ideal, but at least manageable. With the backdrop of the situation in Fort MacMurray playing out this weekend, I’m grateful to have my house intact and in one piece. Stay tuned, the adventure continues on Monday! It was almost three years ago that we first saw this house. I joke now (in that joking sort of way that has more than a nugget of truth in it) that there was a spectacular porch that I adored, an amazing treehouse that enchanted Tristan from first sight, and oh yes, a very nice house in between them. About two years before that, Tristan had confided to his Granny that the dearest wish of his wee heart was a treehouse of his own. The treehouse was in rough shape when we inherited it. The rope ladder was a little tough for Simon and impossible for then two-year-old Lucas to climb. In fact, I’m pretty Lucas never actually set foot in the treehouse. I was up there a few times, but it didn’t feel terribly safe to me. 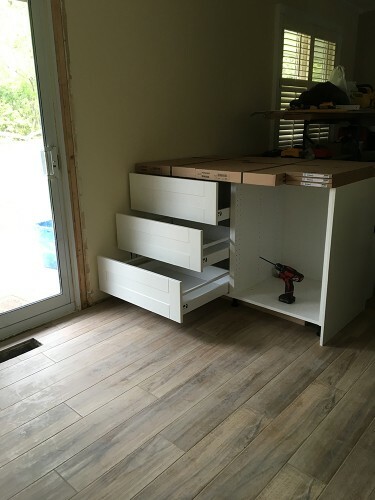 It was made of plyboard and had begun to cant at an awkward angle. For the first year or so, we encouraged the kids to go up in it only one or two kids at a time, but by last summer it was clearly not safe enough for even one 50 lbs kid, and we banned them from climbing into it entirely when the plyboard floor began to rot through. It’s a sort of a kid paradise in the backyard, with an enormous play structure, a swinging rope and a tire swing, which took away the sting from a treehouse you could see but not use. But this spring we noticed the playstructure too had drifted away from “weathered” and toward “rotting” in more places than one. Last year we replaced the swing set portion, but it was clear that the rest of it was deteriorating quickly. Beloved and I decided to act on our idle year-old plan of getting a quote from someone to get them fixed up. A friend of a friend, and conveniently someone from our local school community, came out in June and took a look at the treehouse and playstructure with an eye to rehabilitating one or the other. The prognosis was grim. Neither could be fixed – they’d have to be razed and rebuilt. The playstructure would have probably come in around $5k to $6k to replicate (have you seen the insane prices on these things??) and about a fifth of that to rebuild the treehouse. If you follow me on any other social media, you might have seen some vaguebooking status updates as Beloved and I debated the merits of trying to do the job ourselves or hire a competent professional. For perhaps the 300th time since we moved into this house of love and ongoing challenges, I wished Beloved or I were handy folk. 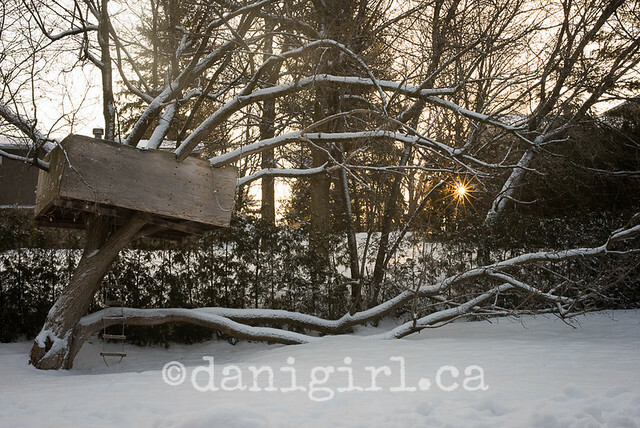 Alas, no hero stepped forth to rescue us from our treehouse dilemma (hey, sometimes you just gotta ask!) and Beloved and I were left to our own devices. 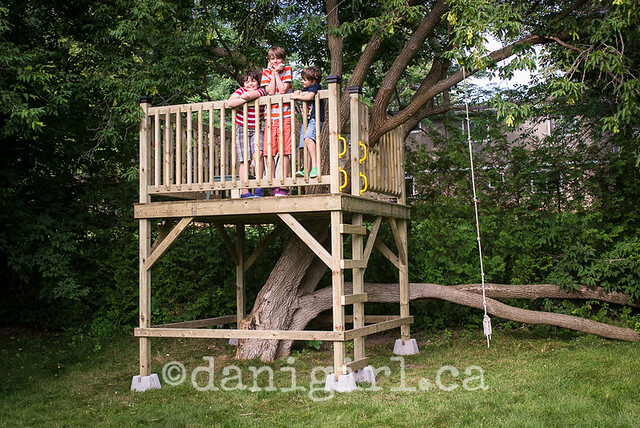 I’m pretty sure we *could* have adapted the plan put together by the contractor and built something that vaguely resembled a treehouse, but the more I thought of my children, and the neighbourhood children, to say nothing of the children I am occasionally paid to photograph, being suspended five feet off the ground on something Beloved and I built? Let’s just say I lost a little bit of sleep over this one. And it seemed like a crappy thing to do, accepting a quote and then filching the plan. But oh how I agonized over it all. 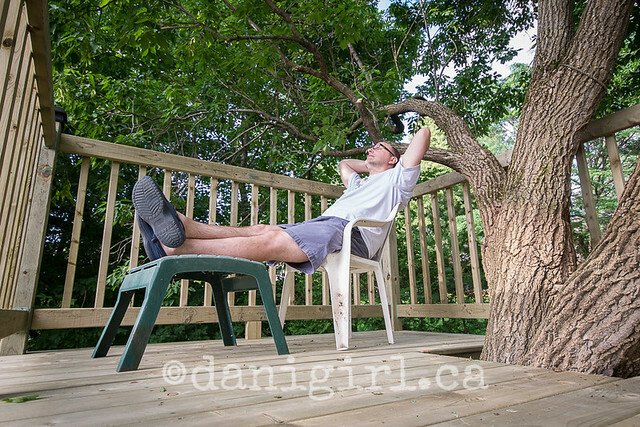 The day we finally decided that we’d rather invest in the treehouse than in some of the other home repair jobs that also desperately need some attention (and money!) around the house, I actually cried a little bit. I didn’t realize until we decided to go ahead with the project how badly I wanted to do this for the boys. There’s not much of a playground culture here in Manotick, and I love the idea of having the kind of yard where neighbourhood kids can play. And Tristan is 11 years old now – his treehouse years will soon be behind him. (Although Beloved said something about future girlfriends and the treehouse which I will judiciously choose to ignore.) I imagined it as a lure away from those infernal screens they all adore – but wouldn’t you know it, the household wifi reaches all the way to the treehouse! 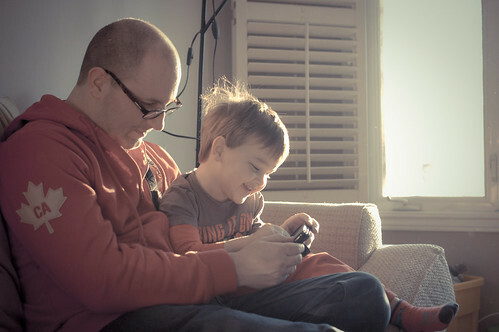 Mostly, though, I just wanted a safe place for them to play, to climb and invent and adventure and be boys. We love it. LOVE it! It’s safe and built with clear attention to detail, it’s big enough to support a handful of kids, it’s easy for even wee Lucas to get up and down by himself, and I can conveniently see what shenanigans might be going on through the rails. 😉 We decided to go with independent supports so we didn’t have to rely on the weed maple for structural integrity. I can imagine things like a rod for puppet-theatre curtains on the underside or perhaps a little clubhouse with benches — after all, I’m not averse to building my handy skills on things that are not suspended five feet off the ground! 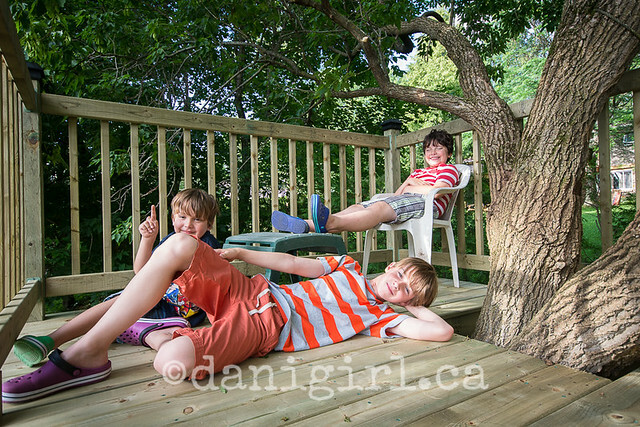 The only downside is that I lost access to a favourite tree limb for posing families during porch portraits but can imagine a whole new world of possibilities for my outdoor “studio” now. After what seems like endless dithering and angst, I can only wonder why we didn’t do this sooner. Best! Treehouse! Ever!! Hey Universe, it’s DaniGirl calling! DaniGirl! Always a pleasure to hear from you, friend. What’s new? Ha, as if you don’t know. Universe, you are a mischevious scamp! Well, that’s true enough, but what in particular insipres you to say so? You’re making me a little crazy with the good-news bad-news game you play. Couldn’t we just skip the stress of things falling apart and then things falling in to place to make them okay again and just stay on an even keel for a while? Do we have to do this every time? Oh, I get it. You’re ticked off about the porch! Damn right I’m ticked off about the porch. 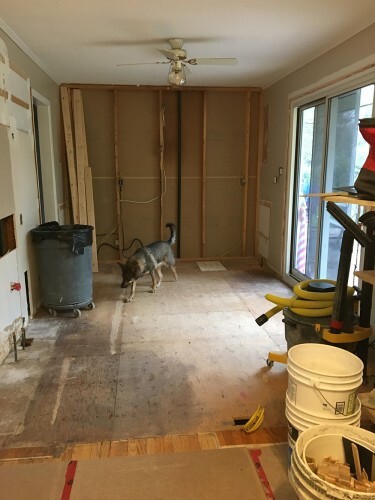 More like devestated – I moped for days when I found out that we’d have to tear up the porch and the garden in front of the house to replace the seeping sewage pipe that runs from the house to the septic tank. Well, you could look on the bright side. A seeping sewage pipe is a lot easier to deal with than, say, a burst sewage pipe spewing unpleasantness all over your basement. I know, I know! I am supremely grateful for that. And I’ve found what I hope is a decent contractor who will not only carefully disassemble the porch and dig up the pipe so the plumbers can come and replace it, but he’ll then reassemble the porch and give it the paint job that I’m now really glad we didn’t end up giving it in April like we’d planned. See, that’s all good news! But Universe — it’s the porch! When we first fell in love with the house, it was because there was an amazing treehouse in the back and this spectacular porch in the front, and hey lookit that, a really nice house sandwiched in between them. And now the treehouse floor is rotting and the porch — the porch! — needs to be torn up. And as if all that weren’t enough, you know I use the porch as my photo studio. I’m pretty sure nobody ever had to tear up Karsh’s photo studio to replace a damn poop pipe! Now now, DaniGirl, don’t get yourself into a froth. You seem quite confident that your new contractor friend will put the porch right back together again, and with a fresh coat of paint to boot! The garden will grow back – it’s all good! And speaking of photos, didn’t you like that little gift I sent you under the guise of your monthly sales statement from Getty Images? Erm, ya, I did kind of cry when I opened my sales statement this month and saw that it was four figures. I can’t believe some ad agency in the UK paid more than $4500 to use this photo of Beloved and Lucas in their advertising campaign. The part about potential use on a billboard has us all snickering. 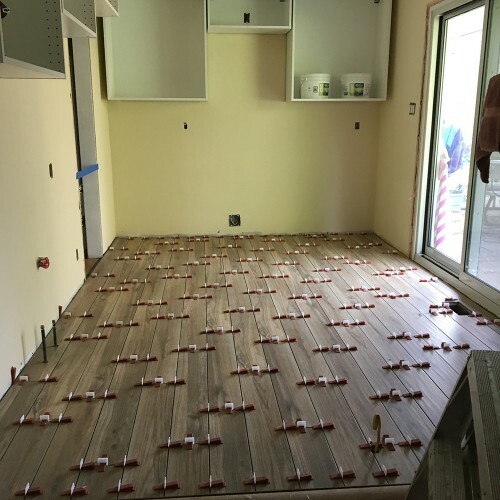 So that does help cover more than half the cost of the poop pipe repair and unexpected porch renovation. Um, thanks for that! Watching your reaction was more than worth it, DaniGirl. You were pretty funny, sitting in the parking lot of the boys’ school, bawling your eyes out as you read the statement on your iPhone! Ya well, you kind of caught me off guard with that one. I made more from the sale of that one photo than I have with the rest of my Getty sales combined! So, um, Universe, at the risk of sounding ungrateful…. Um, would it be possible to ask for one more thing? I’m not trying to be greedy, but… well, you remember when we replaced the furnace in December? Yes, that was another big bill you paid out this year. Indeed. I swear, we are rebuilding this house one disaster at a time. It’s like Steve Austin: “We can rebuild it… we have the technology.” Ahem, anyway, remember how the furnace guys found the coil for the air conditioner so full of dog hair that they said they couldn’t clean it, they’d have to replace it? And if they did that, they’d pretty much just have to replace the entire A/C unit? And we looked at the $5K we’d just forked out for the furnace and balked at the idea of spending another $3K on the spot to get a new A/C unit? Yes, I remember all that. Seemed like a good financial choice at the time. Ya, we thought so, too. It seemed like a very prudent plan to save a few bucks and do without A/C — in the winter time. Universe, it was bloody unbearable hot in the house yesterday. So if you don’t mind, could you keep the temps down to a nice mild 30C or so for the summer? I don’t mind it hot, but 42C in the humidex is a little much. Seriously, Ottawa was the hottest spot in the whole damn province yesterday! Hmmm, I’ll see what I can do, DaniGirl. Or, yanno, if you can’t do that, maybe another one or two of those jaw-dropping statements from Getty? Just, yanno, until we get the house issues under control again? Oh, and please, for the love of all things holy, could you please send a little extra protective vibe when they replace the poop pipe? I can handle the repair to the sewage pipe, but I still live in fear that something bad (and expensive) will happen to that septic tank. Replacing the septic tank would make the poop pipe repairs seem like, well, a drop in a very unpleasant bucket. I’ll let you know, DaniGirl. You just keep taking those photographs! Oh I will, Universe. You know I couldn’t stop now even if I wanted. Take care of yourself! The one with the gas leaks. Plural. As in, more than one.